There’s room for passion in her life—but that’s only physical. And Caddie keeps even those fleeting attachments under wraps, secretive, because she knows that when a journalist even appears to lose her detachment, she is already lost. So what is Caddie to feel when her lover dies beside her—shot in an ambush on the way to the next promising political interview, across the Israeli border into Lebanon? 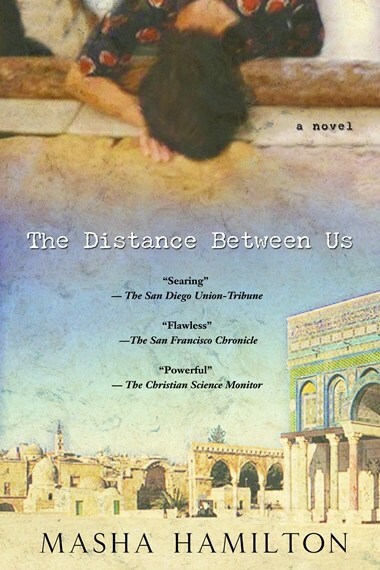 An authentic look at the emotional and ethical chaos within a war correspondent who becomes a bit too involved, Masha Hamilton’s The Distance Between Us is a straight-ahead story of human passion—desire, conviction, and the guilt of a survivor—struggling for order within the frayed justice of the Middle East conflict. A seasoned journalist herself, Masha Hamilton brings to this revealing novel the sharp eye and deep empathy that marked her debut, Staircase of a Thousand Steps (BlueHen, 2001). Beautifully turned, and peopled with an astounding cast of characters who are as true as they are perceptive, The Distance Between Us is finally the portrait of one woman’s search for the narrow pass between vengeance and emotional survival, when her only true attachment has been torn away from her. They zoom up the narrow, winding embankment to Jerusalem, the road everyone takes fast and careless as if they’re racing to shake the hand of God, as if they’re so joyful to be in the Land of Abraham that they’re willing to die the moment they get there. The windows are down and Caddie strains forward. The air blasts her face, supports her shoulders and forces shut her eyes. The car leans and at that moment, the memory of Marcus intrudes. She can’t feel his full weight, only his hand, its fierce pressing at the small of her back, and his breath at her ear as though he were whispering. “What?” the taxi driver asks. The driver nods knowingly. A person muttering as she enters the Holy City is not uncommon; he takes it in stride. Caddie’s colleagues will not so easily overlook it. “Your first time?” the driver asks with misplaced confidence. She guesses from his accent that he is from eastern Europe, and two weeks ago she would have already engaged him in conversation, asked where he was born and how he finds it here, what he likes and what he doesn’t, how many children and grandchildren he has and what they do, because you never know where a good story might begin. Now, though, she wants to eavesdrop on her own thoughts. She shakes her head. “Nope.” Leans back and closes her eyes. The driver, giving up – what a shame, his passenger is lousy for conversation – turns up the radio and begins to hum along. Measured closeness and a dose of dulled feelings – that’s what she has had to learn. That gets her the interview and keeps her safe. She opens her eyes and shrugs to rid herself of the doubts that stick to her like a burr. They’re off the highway now, driving among the blond bricks of the city, following a finger of Jerusalem to its very palm. The driver drops her at the corner of her sinewy street and she walks the rest of the way, a few steps behind a nun. Three Hasidim hovered around a newsstand glance her way as she passes. A young Israeli in leather sandals spits out the shells of sunflower seeds as he hums a tune she recognizes, At Khaki li Ve’echzor, about a fallen soldier. Someone’s wash hangs from a rope strung between buildings, dark clothes coupling with pale sheets. What a concoction, Jerusalem. It took Caddie no short while to come to terms with its heap of competing religious rituals: rabbis issuing eerie and obscure edicts about light switches and women’s wigs; imams with their barely coded urgings to the street; priests swinging platters of incense and muttering in inconsequential Latin. All of it colliding and overlapping like an exaltation of crows within a city that often seems far too compressed. She remembers striding off into Jerusalem alone that first day nearly five years ago, eager to absorb the territory she’d been newly assigned to cover. She tramped through the walled Old City, paused at an Arab café for a sesame-covered bread ring, and practiced her Arabic with the owner. She fumbled with the still unfamiliar shekels, then boarded a bus full of Israeli soldiers and eventually got lost in Mea She’arim. By day’s end, she sensed what lay over the city like a quilt: large rules with horrifying consequences. Rules way beyond the superficial restrictions of manners she’d known before. Absolute, binding, primitive rules that got their backbone from blood and stones and God. Rules that she didn’t yet fully understand, but knew she had to follow.